The way she says "I don't love you." as if she's trying to convince herself more than him is pretty heart breaking! I'm definitely adding this book to my to-buy list! Such a great scene. I haven't read Graceling and Fire since they were released and probably should reread before diving into Bitterblue. Somehow I have not read this book yet, and now I know that I have to remedy that this year. Thank you for sharing this scene! LORD BRIGAN!!!!!!!!!!!!!!!!!!!!!!!! That is all. I love this! I started to read this book and couldn't get into it, but this makes me want to go back and try to read it again! Great scene, thanks for sharing! Oh dear, *fans self quickly* so touching. 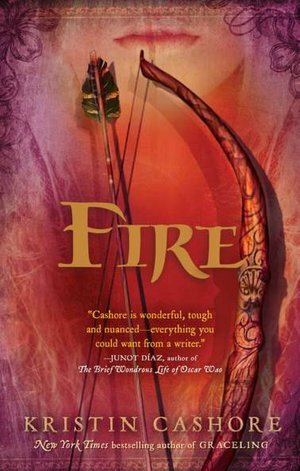 Beautiful, I'd never heard of Fire before today, but I'm definitely going to add it to my to-read list. Oh, that was really sweet. Thanks for setting it up so we could enjoy it the way you see it. They whole story sounds fascinating. Ahh so bittersweet, that ending. Excellent dialogue between the characters. Thank you for sharing. :) Isn't this a great blogfest? What page is this scene on?! I have been looking for it months after reading the book. In my book, it's the end of chapter 28, page 395. Enjoy!